CATCH THE BUS TO UNEARTH! THE unearth festival IS ONCE AGAIN offering a FREE community bus service for residents wishing to attend the event THIS WEEKEND. Friday April 19 & Saturday 20. 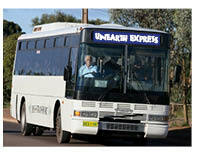 There's no need to worry about driving to this year's Whyalla uneARTh Festival ... there will again be free buses to and from Ada Ryan Gardens on both days of the award-winning event. 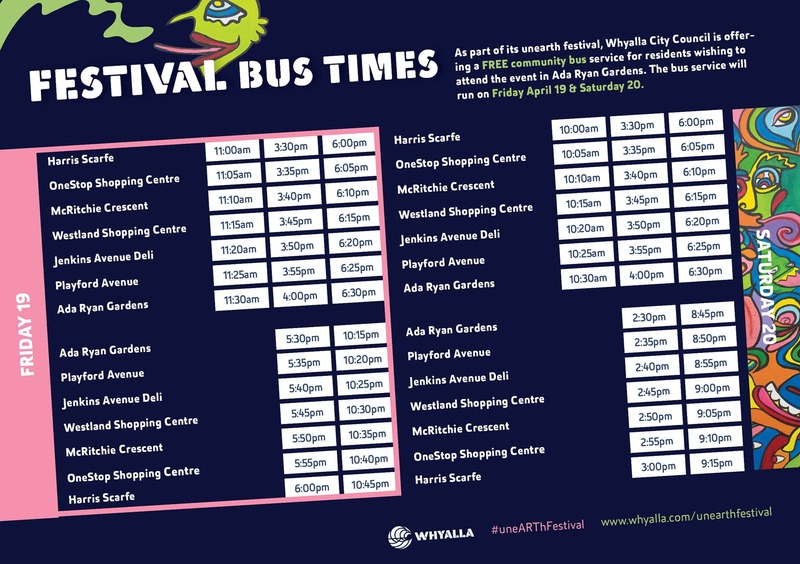 Free buses will start running from 11.00am on Friday and Saturday (April 19-21) from Harris Scarfe, OneStop Shopping Centre, McRitchie Crescent, Westland Shopping Centre, Jenkins Avenue Deli and Playford Avenue and then dropping you off at Ada Ryan Gardens for the the free-admission uneARTh Festival. Then then run you back following the same route. It's all about making the Whyalla uneARTh Festival a truly community event that everybody can enjoy. “The bus service was very popular last year and allowed many families to come along to the uneARTh Festival,” Council Tourism and Events Officer and festival organiser Rebecca Neilson said. "There really was no need to bring your car with this service and for those without a car, it was very much appreciated.